Highly regarded coming out of college, Dawson was taken in the first round of the 1957 NFL draft by the Pittsburgh Steelers. After sitting on the bench and throwing just 17 passes in three years, he was dealt to Cleveland, where he backed up Milt Plum for two seasons. He requested his release from the Browns in 1962 and joined his former backfield coach at Purdue, Hank Stram, who had gone on to become the head coach of the AFL’s Dallas Texans. Stram worked intensively with Dawson, rusty from his years as a reserve, and he took over as the team’s starting quarterback with outstanding results. Dawson was the AFL’s top passer (as well as Player of the Year) in ’62, leading the league in touchdown passes (29), completion percentage (61.0), and yards per attempt (8.9), and the Texans won the AFL Championship. The franchise moved to Kansas City and was rechristened the Chiefs in 1963, and suffered through a lesser year. Chiefs went 5-7-2 to finish third in the AFL Western Division. Fortunes improved for Dawson and the Chiefs in the ensuing seasons. By the rating system then in use, he led the league in passing three times over the next five years (by the modern system, he led it in all five). 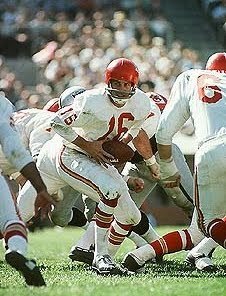 Dawson also led in completion percentage five straight times, TD passes twice (although not when he had his career high of 30 in 1964), yards per attempt twice, and, further testimony to his efficiency as a passer, four times in percentage of TD passes. The team won AFL championships in 1966 and ’69, losing in the inaugural Super Bowl following the former and winning Super Bowl IV (the last prior to the merger of the two leagues) after the latter. Dawson missed time to injury in that 1969 season but was behind center in the postseason and was named Super Bowl MVP. He remained with the Chiefs through 1975, at age 40, and retired with 28,711 passing yards, 239 TD passes, and an 82.6 passer rating. Dawson was a consensus first-team All-AFL selection twice, received second-team honors after two other seasons, and was selected to six AFL All-Star Games and, following the AFL/NFL merger, one Pro Bowl. The Chiefs retired his #16 and Dawson was inducted into the Pro Football Hall of Fame, Class of 1987.